I’m addicted to this blog by a (former) visual manager for Anthropologie…especially love seeing a bit of a "behind the scenes" of all her incredible store projects. Fantastic! Man, I love that Dwell sheet set! It's a bit of a far cry from my current white on white on white. Did you say you got a Dwell duvet? Which one did you get! Katie -- I got the sketch duvet cover... I LOVE it. Those sheets just scream: layabout Sunday morning, reading the paper, sipping a latte. Ooh I love that one! What colour sheets do you have paired with it? Hi, your blog is amazing. Keep going. If you want, you can visit my blog. but soon i'll get some new ones...i'm coveting the Dwell pindot! 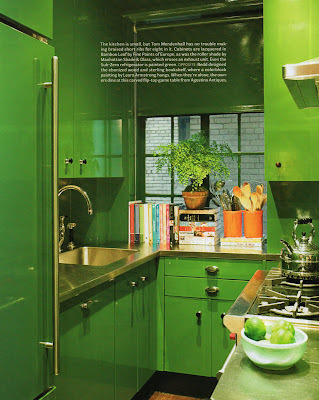 The kitchen, I love the colour! 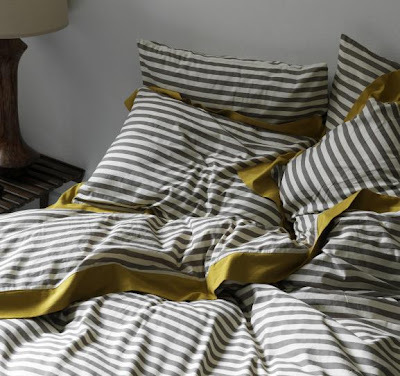 i covet your dwell stripes and i am crossing my fingers that i win a sheet set! also, miles redd has to be up there as my most favorite designer right now. he is whimsical and classy! 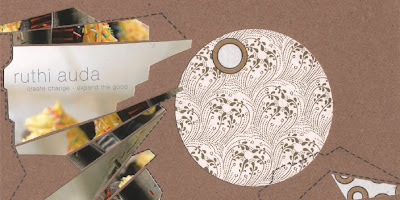 i love that kitchen and love all these things you linked to on this post! The kelly green kitchen is fantastic! What!? That green room is immaculate! I could never own it but I certainly love looking at it. It's like how I feel about winter, sure it's beautiful but I don't really feel like playing in it.